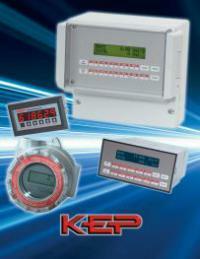 KEP (Kessler Ellis Products) offers a full Range of Electronic Products for Flow, Level, Temperature & Process Control, including Signal Conditioners, Process Level and Temperature Monitors, Field Indicators, Rate Meters, Totalizers, Batchers, Flow Computers, Communication Solutions, Factory Automation and Specialty Flow Instruments. Our technical customer service support team will be pleased to discuss your KEP application. KEP Flow, Level, Temperature & Process Products offer a wide range of precision quality products for your process applications.